The first ad tech IPO of 2013 hit the NYSE today: Marin Software priced its 7.5 million shares at $14 each, raising $105 million at a valuation of $425 million. Trading under the symbol MRIN, the stock saw a small pop in its opening hour, rising by some 40% before going down again and currently trading under $18, a rise of some 20%-28% on the IPO price. Marin had originally priced the IPO at $11-$13 for 7 million shares but expanded the offering ahead of today to reflect stronger demand. Marin’s core product is a platform that advertisers can use to run campaigns across different online properties, including the biggies Google, Bing and Facebook, and different platforms, including mobile, online search, online display and social, with its reputation for search marketing particularly strong. Part of its offering is a big data play, in which it uses the mass of advertising traffic that it tracks to figure out for its clients which formats, and which placements, are giving them their best return on investment for future campaigns. The company’s revenues have tripled in the last three years, a reflection of the bigger shift to online advertising from more traditional forms of media. Marin, in its S-1, cites projections from Magna Global that expect global spend will be $619 billion in 2017, up from $480 billion in 2012. Within that, digital ad spend will be $174 billion in 2017, up from $98 billion in 2012. Marin is on that wave, with customers including ModCloth, PriceGrabber and Symantec, according to its SEC filing. But Marin but also has a road ahead of it to turn that into a profitable ride. According to Marin’s S-1 that it filed in February when first announcing the IPO, the company in the first nine months of fiscal year 2012 made $42.5 million in revenues. That is nearly double the $24.7 million it made in the nine months a year before, but still has not been enough to push the company out of loss-making territory: it also reported a net loss of just over $19.2 million for the period, compared to $13 million a year before. Prior to the IPO, Marin had raised $79.5 million in a series of six venture rounds, with backers including Benchmark, DAG, Focus Ventures and Triangle Peak. Marin says in its S-1 that it might use use some of the proceeds for acquisitions. “We may choose to expand our current business through acquisitions of, or investments in, complementary businesses or technologies, using cash or shares of our common stock. However, we have no commitments with respect to any such acquisitions or investments at this time,” the company writes. For the moment Marin writes that the main purpose will be to raise capital, raise awareness and generally improve its competitive position. Some predict that other ad-tech startups likely to go public this year include Criteo and Rubicon. Rubicon has been rumored as a Yahoo acquisition target (although that now seems to be off the cards), while Criteo currently works with Yahoo in Japan on performance-based inventory and is planning a move into China. Update: We spoke to Marin CEO Chris Lien after the market closed, and he said the goal of the IPO was to “raise our profile and raise the profile of our category.” He added that as a public company, it will be “more of the same” — Marin has been steadily improving its gross margins by 10 percent annually, and he has “an aggressive plan for growth,” with hopes of bringing the company to the break-even point in 2015. 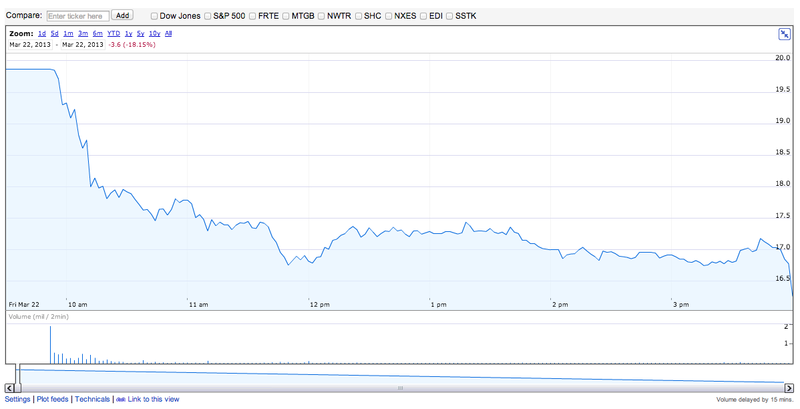 Marin closed off its opening day at $16.26, 16% above its IPO price.